My personal favourite remains Ahasheni. But keep in mind, to check, whether the wine is really bottled in Georgia. Otherwise all the Kindzmaraulis and not only, are coming from Bulgaria (or even Denmark) having nothing common with real Georgian, or a little common with wine as such. 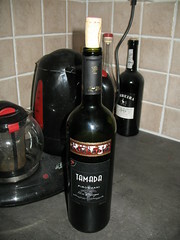 So far have found decent wines in Rimi network in Tallinn, also in Keila - pricing from 59 to 65. Btw, if Ahasheni seems too sweet, try to catch Tavkveri. Once got it through friends, but never succeeded from shops.